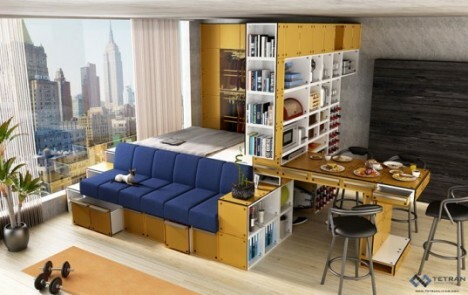 If you want to live in a tiny apartment without murdering your significant other or feeling like your home is a jail cell, you might want to employ a few of these clever small-space tricks, like roll-away closets, double-duty room dividers and multi-level built-ins. These organization ideas include everything from IKEA hacks to full-on remodels and even a hammock that takes up the entire second level of a studio space. 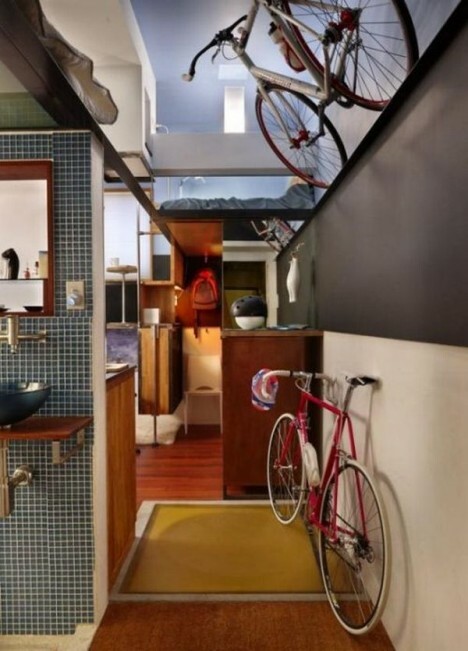 How do you cram an entire apartment worth of stuff, including two bicycles, into a 182-square-foot basement – making it comfortable enough for a 6’2” occupant? Engineer Steve Sauer took inspiration from boats when he designed the layout for his personal space, noting that the most important aspect of making it work is ensuring that everything has its place. 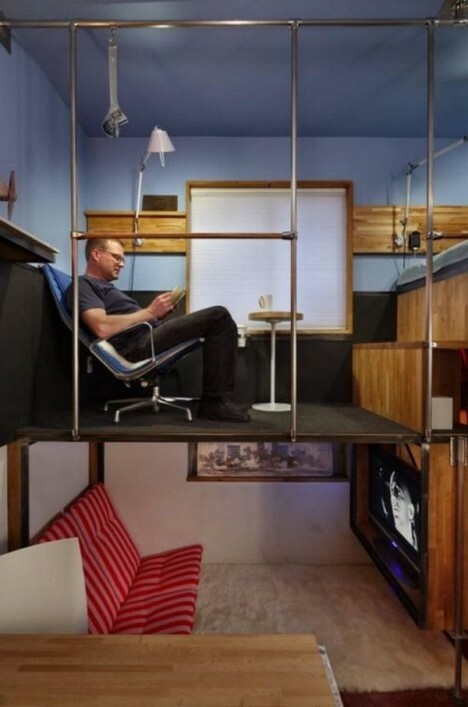 Sauer split the space vertically in thirds to create a seated lounge area, an office and a lofted bedroom. 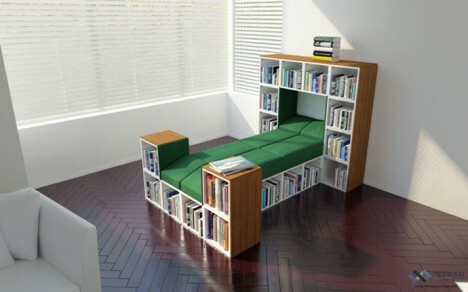 Think you don’t have room for a library in your apartment? This imaginative remodel shows that pretty much anything is possible, even when you’re living in 240 square feet. Inspired by the cabinetry of furniture maker George Nakashima, the wood-paneled addition is built over the kitchen and includes a crawl-in, cubby-like library beside the bed. 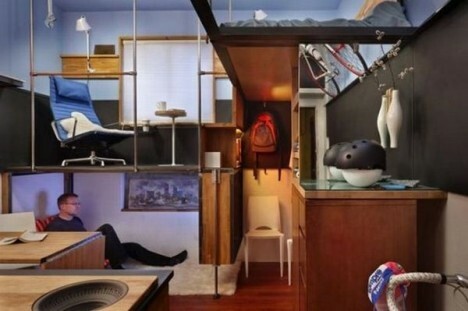 Two students designed this 33-square-meter apartment to be as functional as possible with a few fun and unexpected tricks: a series of rolling modules in the living space that can be rolled together or apart to create custom couches, lounge areas or beds, and a hammock stretching across the space leading to the awkwardly shaped upper level. The slanted ceiling didn’t leave much room for furniture, so the hammock makes the space usable. Put your living space together like a set of Lego blocks, assembling just the right shapes to fit your home and lifestyle, with modules by Tetran. These storage cubes can be stacked and assembled in all sorts of ways to form the basis of couches, beds, side tables, desks, bookcases and practically any other kind of furniture you need. Architects Marc Baillargeon and Julie Nabucet collaborated to convert what was once the master bedroom of a larger living space into a micro-apartment measuring just 130 square feet. 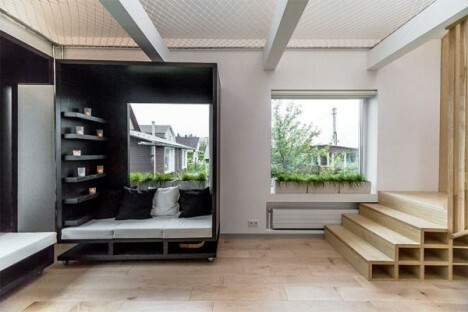 The kitchen is elevated onto a platform that hides a roll-away bed, which can be partially pulled out for use as a couch. 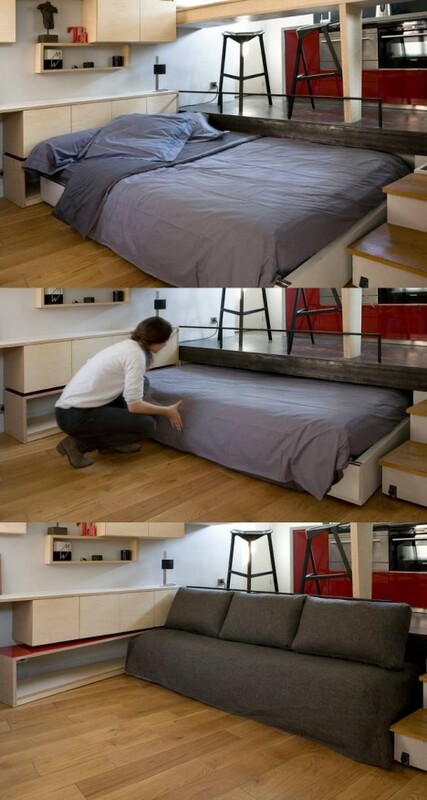 A coffee table hides under a counter when not in use, and the steps double as storage.